I vacation in California for the first time in 1994 with a friend. Heading north from San Francisco on our way to our first destination, I am immediately struck by how arid the climate is in that part of the country. The vegetation looks very yellow and parched, making me more clearly understand the massive incompatibility between the human population in California and the water needed to support that population. Our first mistake is thinking that we would enjoy the scenic Route 1 along the California coast north of San Francisco. We stop briefly at the Muir woods, which gives us our first, breath-taking glimpse of the awesome redwoods, and the startlingly quiet conditions one finds in a redwood grove (even with all the Winnebegos and tourists!). The mistake is that we have no idea how curvaceous Rt. 1 becomes in this part of the state. 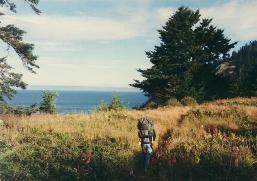 We are averaging about 20 miles per hour along hair-pin turns and steep coastal cliffs. At this rate, we will reach our first destination (Sinkyone Wilderness) about 5 hours behind schedule. After car sickness and slow northerly progress becomes intolerable, we are given directions to get out to Rt. 101, which is a boring parallel route that was nevertheless much more likely to get us to Sinkyone before November. We eagerly accept the trade-off. We stop, seven hours after starting out at San Francisco (I originally estimated it would take four hours), at a small grocery store a few miles from Sinkyone to stock up on food for the upcoming hike. Amazing as it may seem, this spectacular state park is almost totally unknown by the locals at the check-out counter, but the wife of the owner assures us that the south entrance is clearly visible about seven miles down the road. After driving for about 20 miles, we turned around, and begin to panic since it was near nightfall, and we still need to set up our tent in the Wilderness. There were no people or houses or shops to help us with directions, so we simply try each turn-off road, finally stumbling across a narrow dirt driveway that we are sure is leading to a private home. Instead, a sign about 400 feet from the main road (and therefore of no use to people looking for the road) tells us we are on the county road leading to Sinkyone. It is a hellacious 30-minute ride along a bumpy, winding dirt road to the Wilderness entrance, where we set up camp as darkness closes in on us. Backpacks fully loaded the next morning, we set out for a 30-hour journey (see photo above) into a remote Wilderness along the Lost Coast Trail, a 21-mile trek along a coast that time has forgotten. (The Lost Coast is so named because the fault line that runs northwesterly along the coast is positioned in such as way as to make road construction along this portion of the coastline impossible. As a result, access is by foot travel only.) 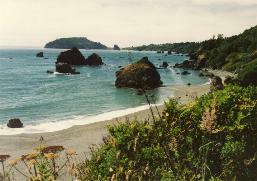 The hike features a seemingly endless series of alternating black sand beaches, gorgeous wildflower meadows, steep valleys, thick redwood forests teaming with wildlife, cold streams, waterfalls, cliffs, tidal pools, and spectacular views of the Pacific Ocean. 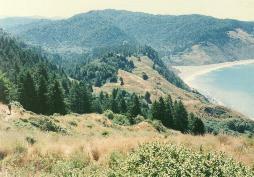 (At left is a photo showing the tremendous coastline on the Sinkyone hike.) Every 5 to 10 miles, a few primitive camp sites are laid out for hikers, only a few of which we see during our hike. The most challenging parts of the hike turn out to be the strength needed to handle the long, steep trail grades, and the fact that we fail to bring along enough food. (Most of what we subsist on during the hike is a few "energy" (candy) bars.) Advice from a friend to pack in a $50 water filter turns out to be a great idea, since streams are plentiful, and saves us from having to lug in a lot of very heavy water. All in all, I would highly recommend Sinkyone to anyone interested in a very scenic and remote wilderness experience not too far from civilization. My guess is that it remains rather nice at this point because so few people know about it, and many are perhaps discouraged by the physical exertion needed to do the hiking and camping. After leaving Sinkyone, we drive north to Eureka, where we join a relatively small group (seven people, including us) for our five-day bicycle tour through California's famous redwood groves. I must say that I was not prepared for the immense size of the redwoods. Seeing them on TV or in pictures simply does not give you an idea of how huge these trees are, and helps explain why so many activists are fighting so hard to save them from the logging industry. I spend a lot of time, as I bicycle through these giants, just shaking my head in disbelief. How can any tree get so big??? It is a humbling experience. Like my bike tour last summer in Maine, this tour features huge amounts of delicious food (I ordered $18 salmon or red snapper each night) and lodging at VERY luxurious inns. They really know how to pamper you on these tours-which allows you to spend your time enjoying yourself, instead of sweating out lodging, food, equipment, and route hassles. The tour company is Bicycle Adventures. Day Three lodging is at the wonderful "Lost Coast Guest Ranch," a huge house out on the coast with a gigantic fireplace, old-style plank floors, a pool table, and very luxurious interior amenities. Just before getting there, we are treated to the sight of a naval base that seems to have no knowledge of the First Amendment (a sign out front told passersby that "no political communications or similar activities" were allowed near the base). We also come across a 500-foot section of road that has fallen into the ocean as a result of erosion. Day Four is in historic Ferndale, home of a large number of old and brightly painted Victorian houses and shops. My friend and I, unlike the others in our group who opt to stay at the Ranch again, make the excellent decision to stay at the Victorian Inn in downtown Ferndale. Our $200 per night second-floor room features a turreted dining room just off of the bedroom, where the circular windows gives us a panoramic view of the main street in the town. I vow to design my house out on my 10 acres in Florida to mimic the dining room and bedroom combo. The most amusing episode at this point is that our evening arrival at the Inn involves following a hostess and porter as they hunted for our room. Unfortunately for them, they are given poor directions, and to their extreme embarrassment, end up unlocking the door and entering an occupied room. But the real comic tragedy for them was soon to come. Four hours later, as my friend and I are lying in bed reading, the same porter accidentally unlocks and enters OUR room (thinking it was unoccupied). My friend and I have a tremendous laugh thinking about how horrified the porter must have been. Another amusing (and inspiring) event we uncover in Ferndale is the annual "Kinetic Sculpture Race," which runs from Arcata to Ferndale every May now since 1970. It is a huge, wild, and wacky event featuring a massive gathering of people who have built the most outrageous, human-powered contraptions you could ever imagine: buses and cars converted into vehicles that move under pedal power, elaborately decorated bicycles shaped like sharks and spaceships. And they are all designed to be amphibious, as well, since part of the race includes crossing a bay. The race brings in people from all over the world. I will be sure to return some day to witness the spectacle. The UC-Davis campus was very enjoyable, with large numbers of bicyclists and joggers and walkers enjoying the paths and vegetation throughout the campus. Another impressive feature in Davis is their downtown parking garage, which shows that the town has enough pride to avoid letting such a facility be so detrimental: their garage features attractive landscaping along its sides, and the entire first floor is a movie theatre! What a great way to turn what is usually a detraction from the downtown into an asset. I would rank Davis right up there with Boulder as a desirable place to live. Palo Alto is almost as nice, although upper income exclusiveness seems a bit excessive. Stanford is a very pretty campus, with several impressive Rodin sculptures, including the famous "The Thinker." The town also features some state-of-the-art bicycle features, like "bike boulevards" which are roads which give priority to bikes and discourage vehicle traffic, and a train station that has a huge set of indoor bike lockers and a highway with a bike underpass. No wonder the Xerox in Palo Alto is able to get 15 to 20 percent of its employees to commute by bicycle. The strange event in Palo Alto is our motel stay, where we are awakened by a 2:00 am phone call from the police, who want to know if there is a person in our room who has just called and threatened to commit suicide. Being only partially coherent due to the time of night, I struggle to explain that we are O.K. Unfortunately, the police are also waiting outside our door, and bang on our door about a minute after I started talking with the officer on the phone. My friend has to run to the door and tell them we were all right, while I am getting worried that the officer on the phone might not be convinced I was telling the truth. After all, if you think about it, how does one convince the authorities that you are NOT insane if they think you are?? Even a mentally disturbed person can put on a brief display of normality if that person is trying to manipulate an authority. It was all rather Orwellian. As it turned out, the suicidal person was calling from the same motel chain and motel room, but gave the police the wrong city. Berkeley, despite all the wonderful things I have heard about it, is mostly a disappointment. Too much traffic, and very hostile for pedestrians and bicyclists. A large number of street people are roaming around, and many areas are extremely run down. The famous "People's Park" is interesting in the sense that we were able to see that the high level of political activism continues to make things volatile in Berkeley. UC Berkeley features a pleasant campus. The one bright spot for our visit there is the bookstores. I found several excellent books at very reasonable prices. People in politically active communities tend to read very good books. The City was founded in 1866, and is most famous for containing UC-Berkeley, which was the cradle of the student protest movement-especially the free speech movement-in the sixties. It is sometimes referred to as "The Athens of the West." Our next stop is in another college town: San Luis Obispo. On the way there, we enjoy the famous Big Sur coastline (see photo at top of this Web page) and see the road leading up to the Hearst Castle. We mostly visit "SLO" to spend some time with a good friend of mine who formerly lived in Gainesville. He is able to show us around what turns out to be a very nice city of about 60,000 people. Like Davis, I could easily enjoy myself living in SLO. Lots of intellectual culture, beautiful coastline nearby, excellent hiking and mountain biking trails in the area, a tree-lined downtown that is pleasant enough to draw large numbers of summer tourists, and a nice historic homes district. Next stop is the incomparable Yosemite, which, like the redwoods, I am unprepared for. Breath-taking is a description that fits this place perhaps more than any other I've seen. As we were told earlier, it is easy to escape the huge crush of tourists by simply hiking a few miles away from the valley (see below for an example of what we saw on our hike). I'd like to return again some time for some hiking and camping in the backcountry. After all, there are over 700,000 acres to explore here. Yosemite features glacial granite peaks and domes that rise over 3,000 feet. Approximately 95 percent of the park is designated as wilderness. Yosemite Falls is 2,425 feet high, and is the highest waterfall in North America. Driving out of Yosemite gives us a few surprises. First, the road heading northwest out of the Park is seemingly endless in length. It takes hours to get from the valley to the exit. Along the way, as I am driving through the night, I come across a "cattle crossing" sign, which I promptly ignore. I have never seen cattle on a road before (I did almost run over a deer that leaped across my path while driving in Yosemite.). Bad idea. One mile after the sign, I make an emergency swerve to narrowly avoid slamming into an 890-pound heifer walking (as you would expect a pea-brained beast to do) down the middle of the two-lane road. You can bet I was alert after THAT. After Yosemite, we spend the day on the Stanislaus River. The river turns out to be less than hoped for excitement. The river has been so altered by dams and reservoirs over the years that it is now only a shell of its former mighty self. It is, nevertheless, the most popular whitewater in the state. It was fun, but no where near as exciting as my previous whitewater experiences. I had purposely selected a relatively tame river, since my friend, as a first-timer, was understandably nervous. But even she was somewhat disappointed, and we quickly decide we should make a trip to the Chatooga River (the Deliverance river) soon. Finally, it was on to the City by the Bay-San Francisco, "everyone's favorite city." Along the way on the highway, we pass huge agricultural areas and the most enormous windmill farm in the galaxy (I feel like I am in a Sci-Fi movie). The city is everything it was billed to be. Great sourdough bread, wonderful transit system (we ride trolleys, cable cars, electric and diesel buses), mind-boggling numbers of brightly painted and elaborate Victorian homes, very rich culture (we browse about 20 bookstores), and excellent restaurants. We ride our bikes across the Golden Gate Bridge (Opened in 1937. What a rush! What a view!) We visit the famous Haight-Asbury district and the Castro district (both were bustling with street activity-so typical of a healthy city). On one night, I am delighted to see the monthly "Friday Night Skate," where hundreds of people skate through the city streets on rollerblades in a group large enough to allow them to take over the street. Their destination is always a nightclub, where they go dancing (on this particular night, it was Club DV8). Another monthly event in the city, which we are not lucky enough to witness, is the "Critical Mass Bike Ride," where other hundreds take over the streets in the name of a sane form of transportation. We find that even in the summer, the wind, rain, and cold can make the city quite blustery. But overall, the climate is mild. Sprawl is reined in by the ocean to the west, the Golden Gate to the north, and the vast bay to the east. 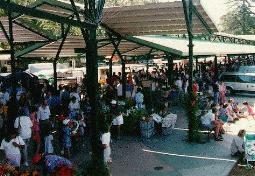 The city was established in 1776 with the beginning of a mission dedicated to St. Francis. In 1945, the United Nations was founded here. It is the second busiest port on the west coast. The city is considered the king of cuisine in the U.S., with 4,000 restaurants and internationally known shopping districts. In 1990, 1,603,700 people lived here. Contains the largest population of any state in the U.S. (1994 population was 31,431,000). Ski areas and brutally hot deserts are found here. The state has 1,264 miles of coastline and is 350 miles wide. Nearly every crop in the U.S. is grown here (at one point, we drove through what seemed like hundreds of miles of farmland). The state is a major breadbasket for the U.S., leading the nation in the production of over 35 fruits and vegetables. In 1848, gold was discovered and touched off a mass migration. Statehood came in 1850.